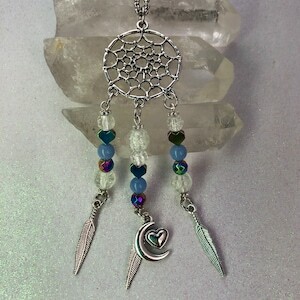 Dreamcatchers are so magical and I love to make beautiful beaded ones. This design came out so cute! I love the shiny silver with blue and black. I used blue howlite turquoise stone beads that are just the perfect blue color. They go beautiful with the black lava stone beads. And you can put a couple drops of your favorite aromatherapy oils on the lava beads and they hold the scent, creating a beautiful aromatherapy pendant. The porous lava beads soak up the oil and you will smell wonderful all day. 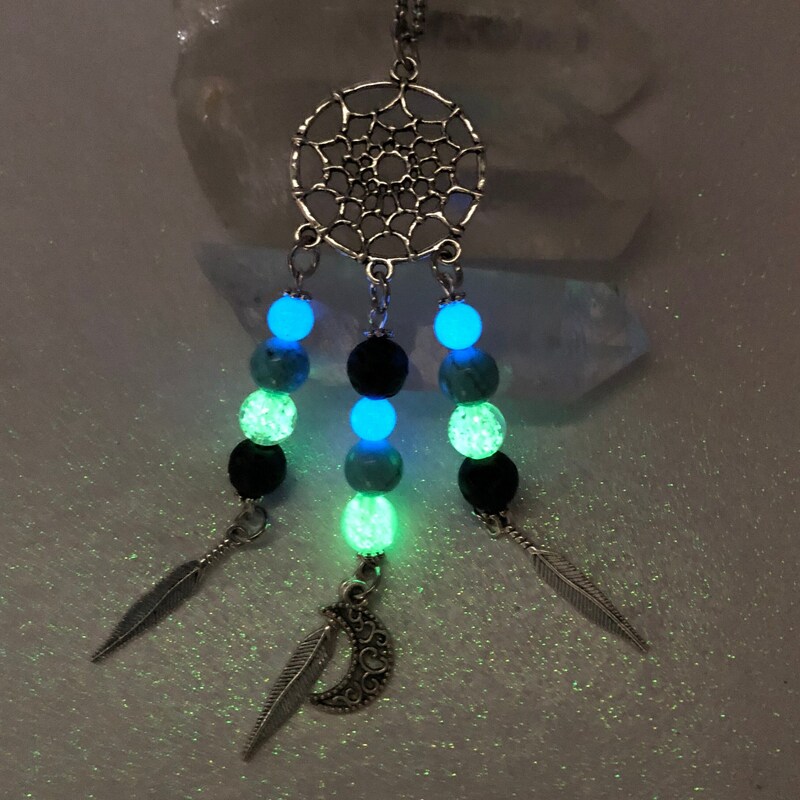 They go perfect with some galaxy glow glass beads and a vintage style moon charm. And of course little silver feathers. 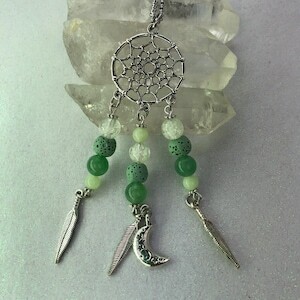 A beautiful hand made pendant with magical properties that you will love to wear. 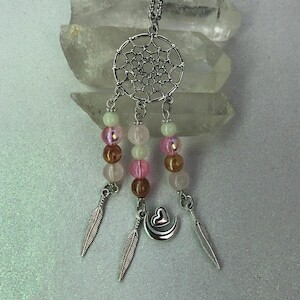 This listing is for one dreamcatcher necklace on matching chain. Howlite: A beautiful stone with a low calming vibration. Howlite has a soothing energy that can help calm anger and bring peace to those wearing it. 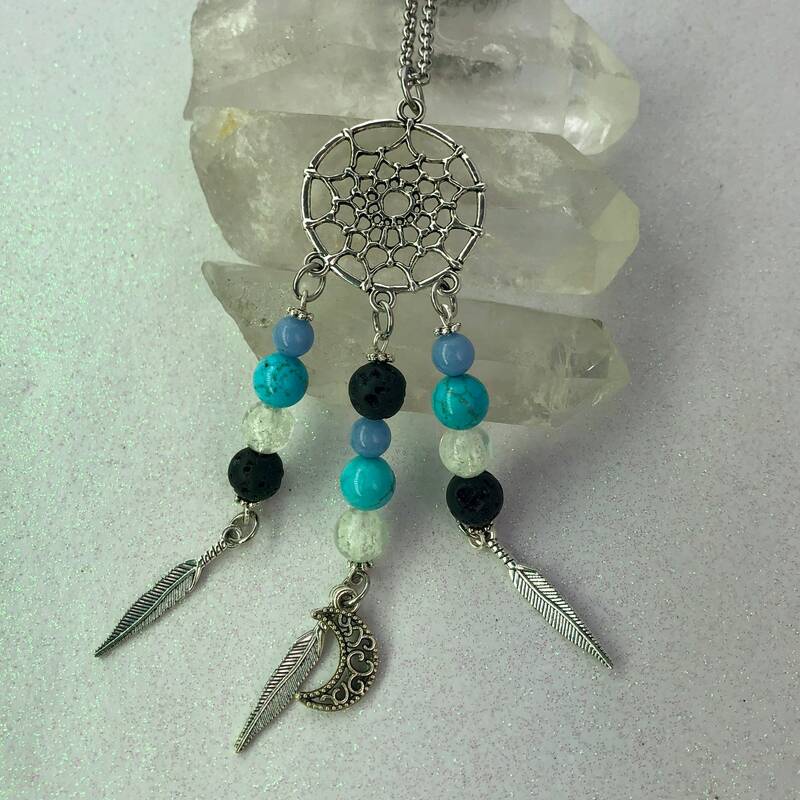 Placed on the third eye it is said that howlite can help you access past lives and deal with emotions from past experiences. 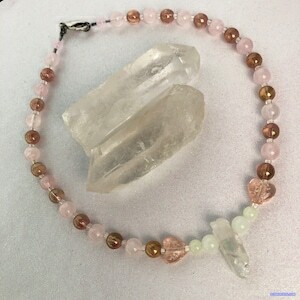 Lava: A natural stone that can help deepen your connection to Mother Earth. A beautiful black stone, lava is also a stone that you can apply an aromatherapy oil and experience the positive energy. Some also believe lava can aid in fertility. It can being strength and courage and help with change.